It is now officially Autumn in the Southern hemisphere. It doesn't feel like it at the moment as temperatures reach nearly 40 degrees. 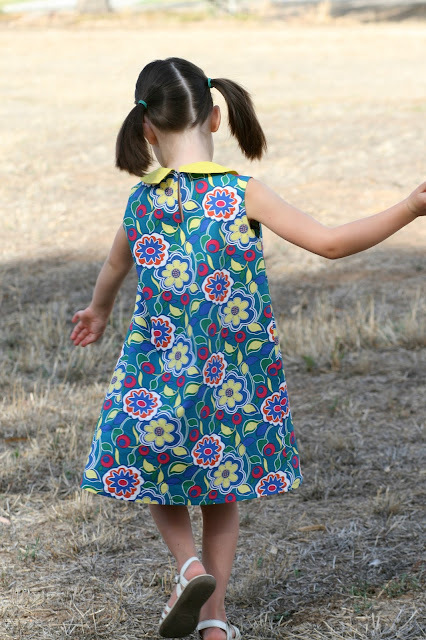 A few weeks ago R started school and I decided to stop sewing summer outfits, however I still wanted to sew the Eleena dress, the latest pattern from Olga of Coffee + Thread. I wanted to make something that could be worn now while it is still hot as well as during cooler months. I decided to sew a sleeveless dress. 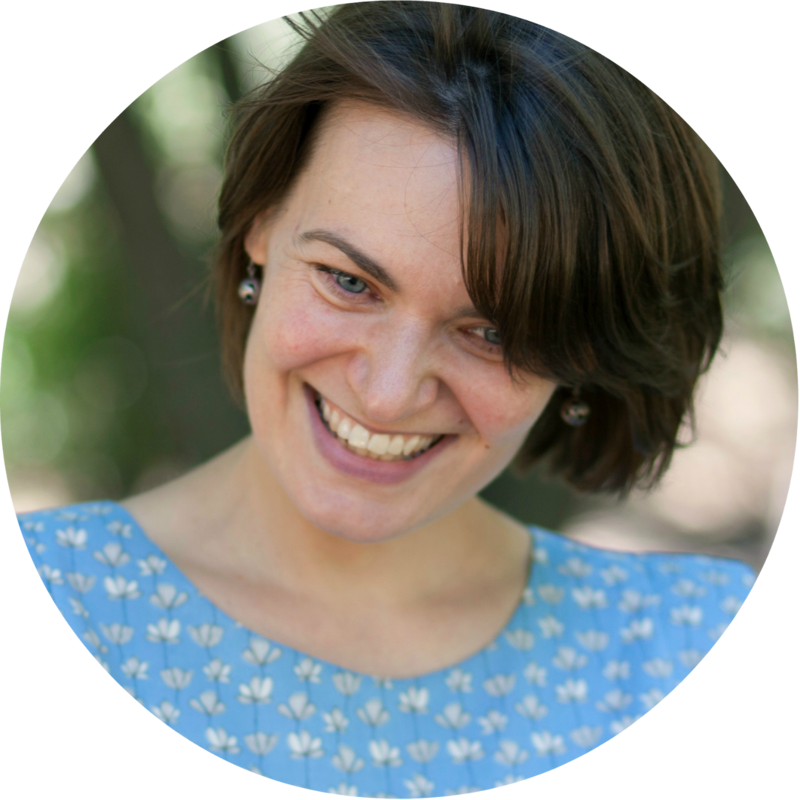 R can pair it up with a cardigan or wear a long sleeve tee underneath during cooler months. I love the pleat. One can play with fabric options to customise the look of the dress. I decided to cut the front of the dress and the pleat as one continuous piece. I simply subtracted the seam allowance from both pieces, taped them together, and viola! OK, I can't really claim to be a genius for doing so. Olga explains how to do this in the instructions. My good sewing machine was being serviced while I worked on this dress. I used my first basic sewing machine which came with a rather unfortunate zipper foot. I decided to skip the zipper full stop and made a loop and a button closure instead. To do this I shortened the back of the collar pieces by 0.5 cm, attached the collar to the dress as per the instructions, and then made a slit about 8-9 cm long in the middle of the back piece. 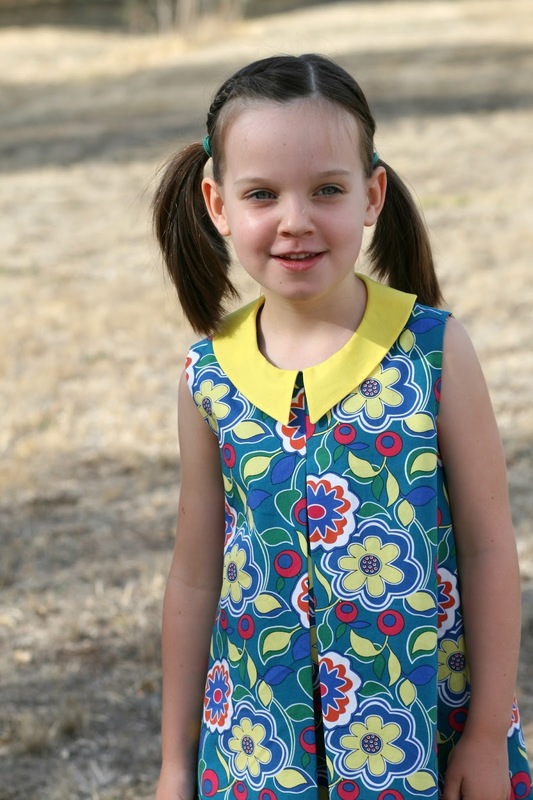 Because of this I could not follow the construction method provided in the tutorial to sew the armholes. Instead, I used the 'Burrito method'. 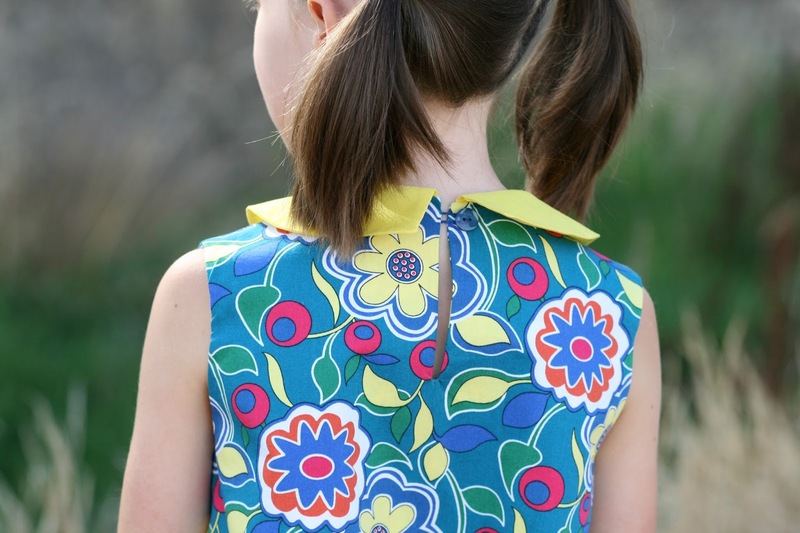 It was the collar that drew my attention to this pattern in the first place. I have not made many collars and I feel I am still trying to work out what works best for me. 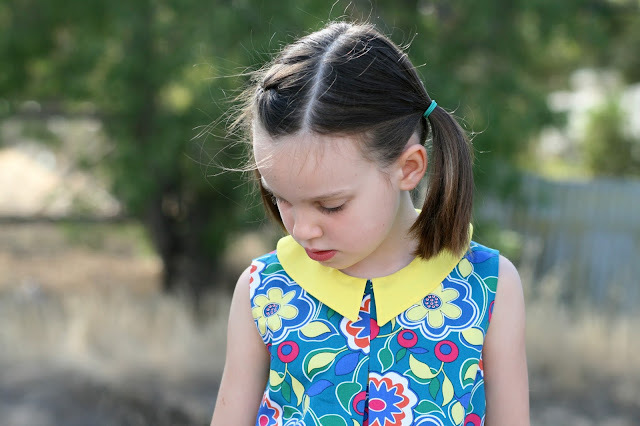 This collar is made from voile that seemed to match the yellow on the body of the dress almost perfectly at a fabric store. In reality it does not. I think my lightweight interfacing is not lightweight enough as the collar poked up a little which is noticeable on the previous photo. The issue is not as prominent after the dress has been washed. 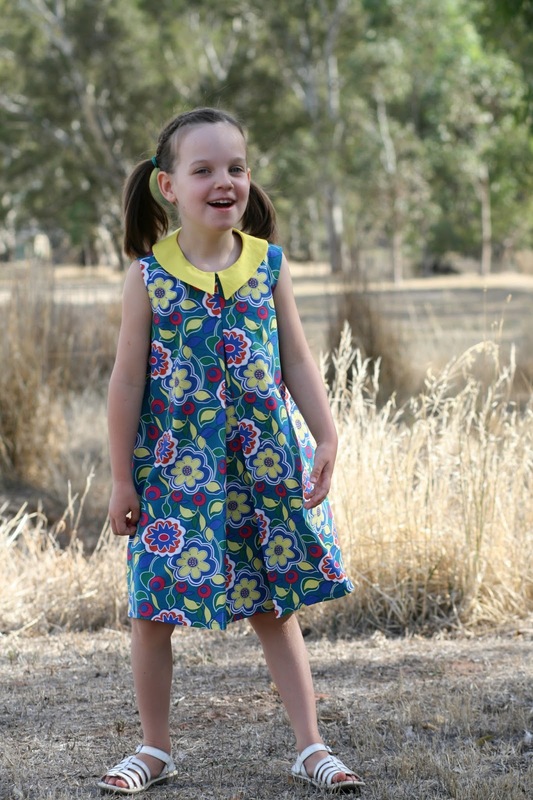 R was (and still is) very pleased with her new dress. 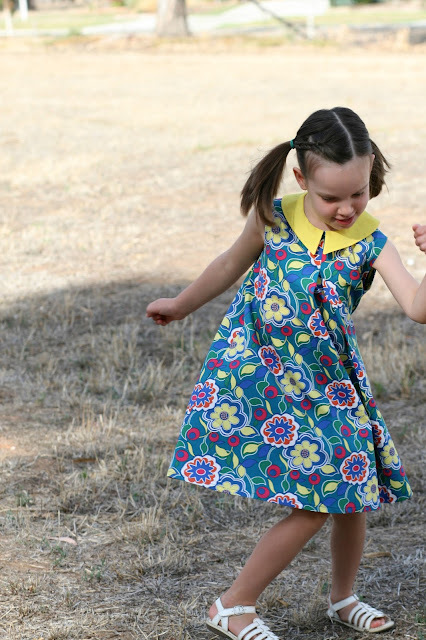 Her love for this dress grew even stronger once she discovered the twirl-ability of her new Eleena dress! 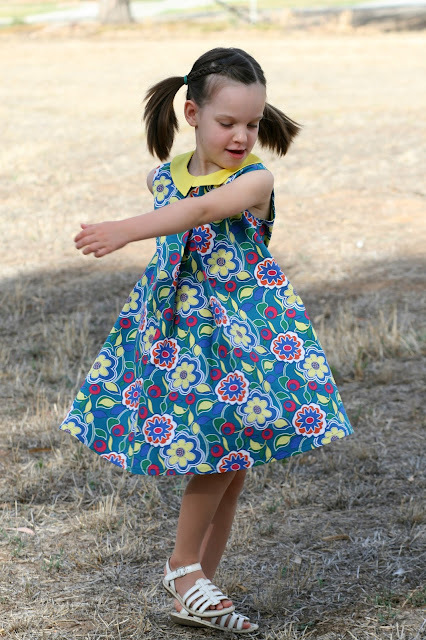 You can purchase The Eleena dress pattern for USD7 (regularly priced at USD9) through the 7th of March at 11:59 pm EST. You can try your luck to win two patterns from Coffee + Thread and some fabric. If you need some inspiration please check out what other tour participants have made with this pattern! It turned out great. Very swirly too! Beautiful dress, Jenya, and such perfect points on that collar! Such a beautiful dress, Jenya! Really turned great!Thank you so much for being on the tour! I really like your loop closure mod - I actually think it is an improvement on the pattern! Much simpler and more "little girl." I love this version of the Eleena! I'm always attracted to bold florals but never have the courage to use them -- this one has me thinking, though... I also love what you did with the back closure. I might have to give it a try sometime! Cute dress! I love the retro feel of the print with this pattern! Yeah, selecting fabric becomes harder as the girls become more picky! 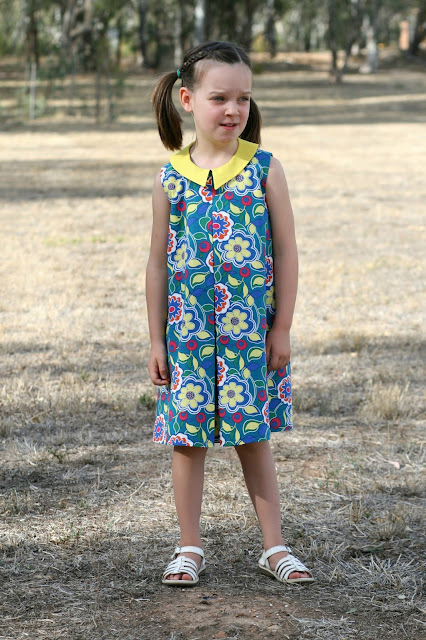 Such a sweet dress, and I like the button closure! It's a nice summery touch.